Created by designer to the stars, Hollywood's Neil Lane, this distinctive engagement ring is perfect for the bride who loves to be unique. Crafted in a blend of 14ct white and rose gold and showcasing a round cut diamond in a cushion halo sat upon twisting shoulders, totalling 0.53ct. 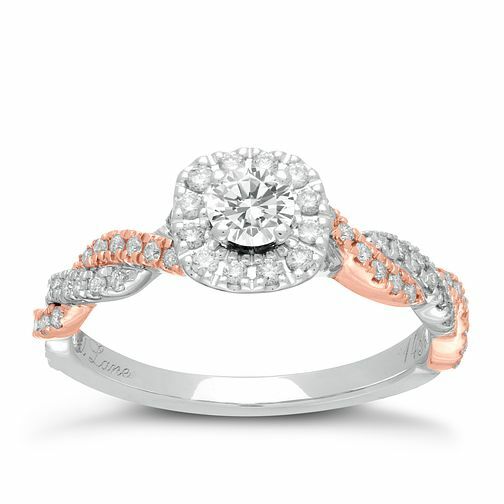 Neil Lane 14ct white and rose gold 0.53ct diamond ring is rated 5.0 out of 5 by 8. Rated 5 out of 5 by Anonymous from Stunning ring I have had my ring for about a year and still absolutely love it! Everyone compliments it, it’s so unique and sparkles in every light. It’s not too big that it catches or looks too flashy. Just simply stunning. The rose gold tone isn’t to ‘in-your-face’ but just adds that extra bit of special to the ring. Anyone looking for that something a little different, this is it!